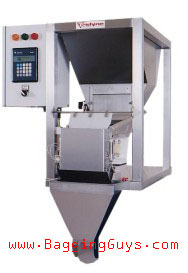 The F-99 Net Weigh Scale automatically weighs material into a small collection hopper. When the target weight is reached, the material is discharged into your empty container. Can be used in semi or fully-automatic modes! The F-99 has been replaced with the new & improved F-100! Click here for details. Standard 2-Speed Filling for Optimal Accuracy AND Filling Rates!